Caves (‘grottes’ in French) are fragile bio-climates. Distinguish between caves that open to the air, that ‘breathe’ such as Font de Gaume & caves which are shut to exchange with outside air such as Lascaux & Chauvet. This is usually due to the overhanging roof at the mouth of the cavern collapsing & blocking the entrance. For instance, when Chauvet was discovered in 1990’s, it was very quickly sealed off & kept air tight (actually it’s up a gallery or ‘floor’ if you like in a system of different caves). Its climate is monitored by CNRS scientists using the latest in automated technology. The variations in it’s micro-climate are less than a hundredth of a degree centigrade over the course of a year. So imagine what a shock it was to Lascaux to be opened up to 20 000 visitors breathing CO2 & carrying spores of green algae on their shoes. Lascaux was shut to the public in 1963. It was brave & good decision by the French Government, acting as guardians. An exact life-sized replica ‘Lacsaux 2’ is open to the public & it’s well worth the visit. You can also take a virtual visit, freely offered to the world by the French Government. nb. This is what I’ve quickly put together from the internet from various sources. nb; this is not a scientific report nor is government-sponsored nor is in any way an accusation. nb. I am not a specialist & don’t knwo anything first-hand. 08-SEP-1940 the 17,000 years old paintings were discovered by boy & ‘robot’ the dog. 1940’s Cave entrance opened up. Cave floor disturbed before proper conservation measures & archeological explorations were made ( the now current archeological practice of touching nothing was unknown. The principal of recognising that future generations may well evolve more elaborate & sensitive means & methods was unknown. The fact that caves are fragile was unknown). Hundreds of cubic metres of soil & rock removed. 1958 first air conditioning unit installed; cave floor further damaged. Walls treated with anti-biotics & fungicides. 1990’s climate control machinery changed to combat (white) calcite formation. 2001 – 2002 first fungal attack of black spots of Fusarium. 2008 Urgent appeal made by UNESCO to French Government; Visit of Minister of Culture to Lascaux. Numeric stimulation model, University of Bordeaux, perfecting various scenarios of climatic control. Facsimile ‘Lascaux 3’ opened to public, with intention that it could possibly travel to other museums around the world. Organised by as an initiative of Christine Albanel, Minister of Culture & Commmunication, & under the chairmanship of Jean Clottes, President of Fédération Internationale des Organistaions d’Art Rupestre. The symposium will promote comparisons between Comité scientifique international de la grotte de Lacsaux (created in 2002) & other research by other teams of multi-disciplines from other parts of the world (Afrique du Sud, Allemagne, Australie, Espagne, Etats-Unis, Italie, Japon, Nouvelle-Zélande, Portugal, République Tchèque). The Minister has promised transparency & free access to real information. Adam says of Jean Clottes : Read his books, they are absolutely wonderful! ‘Un vrai grand homme de la Préhistoire’, he embodies much of the passion, the care & the scientific rigour for the prehistoric heritage of SW France. He was also part of the exploratory team of grotte de Chauvet. 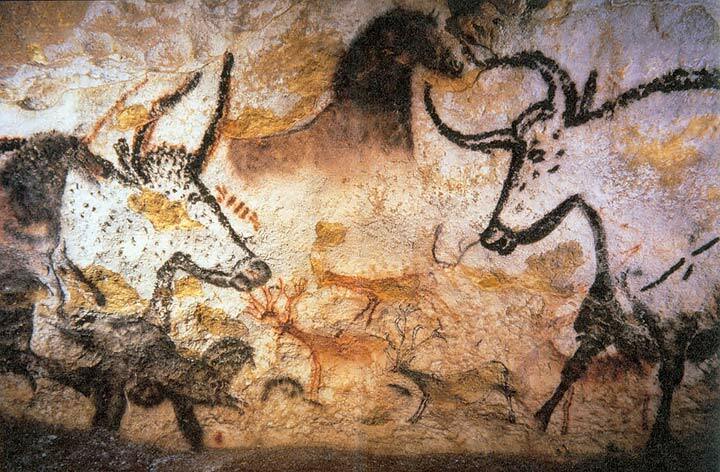 John Berger, speaking of the decision to conserve Chauvet intact & unopened to the public. ” So the animals on the walls there are back in the darkness from which they came and in which they have resided for so long. We have no word for this darkness, this darkness which is very closely connected with light. We have no word for this darkness. It is not night and it is not ignorance. Do I gather that you don’t feel the caves ought to be closed? I wonder how I feel about it – don’t know. Your warmly inspired oil painting is a perfect description of how the caves look to me. This is unambiguous, in my opinion. Of course they should be closed! what i’m ambivalent about is expressing an opinion about how exactly lascaux should be cared for. I’m not a specialist but it does seem a good ideea to ask all the top specialists of the world,- not just french (though they are very very good). the replica Lacsaux 2 is made of fibreglass & i read somewhere that it has recieved over 300 000 visitors since it was opened. The signs of wear & tear are now easily seen… if the hoards of sight seers can wear down fibre-glass imagine what they can do to delicate walls.